Virginia Commonwealth University Professor Dr. Andrew Chesnut will speak at this year’s Ida Wise East Memorial Lecture at the University of Lynchburg. 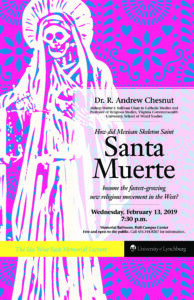 The lecture, “How did the Mexican Skeleton Saint, Santa Muerte, become the fastest growing new religious movement in the West?” will be held at 7:30 p.m. Wednesday, February 13, in Memorial Ballroom at Hall Campus Center. The event is free and open to the public. Dr. Chesnut is VCU’s Bishop Walter F. Sullivan Chair in Catholic Studies. He has written several books and journal articles, and has contributed to his own Patheos Catholic column, The Global Catholic Review, and a Huffington Post blog. His most recent book, Devoted to Death: Santa Muerte, the Skeleton Saint, is the first in-depth study of the Mexican folk saint in English. Dr. Chesnut is currently working on a project about Catholic memento mori in Europe and the Americas. This project will examine Mexico’s Day of the Dead, holy relics, and saints. His lecture will discuss how the folk saint Santa Muerte became popular, what she represents, and why she is worshiped. He will take questions from the audience after the lecture. Dr. Chesnut was chosen by Dr. Nichole Sanders, John Franklin East Humanities Professor at Lynchburg, to give the Ida Wise East Memorial Lecture this year. “As a professor of Latin American history, I wanted to pick someone who represented the humanities,” Dr. Sanders said. The Ida Wise East Lecture series was established in 1979 by an endowment gift from Margaret East Nelson of Norfolk, Virginia, in memory of her mother, Ida Wise East, and in recognition of the lifelong interest of the East and Nelson families in the humanities.